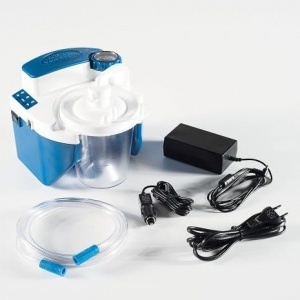 The DeVilbiss Vacuaide 7314 QSU Quiet Suction Unit is the quietest high flow/high suction portable suction machine on the market, offering the same reliable and portable operation you would expect from DeVilbiss but in a significantly quieter unit. The DeVilbiss Vacuaide 7314 QSU is designed to perform effective airways suctioning in a comfortable, safe and hygienic way. Despite boasting more than 50% reduction in noise, it still features a suctioning pressure range from 50-550 mmHg delivered at 27 litres/min flow rate and is designed for most applications. 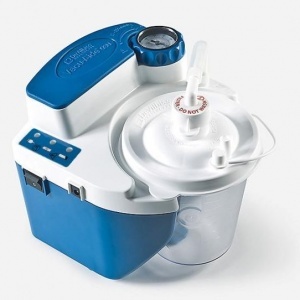 DeVilbiss Vacuaide 7314 QSU Quiet Suction Unit features a 'one button' operation that begins the suctioning and the display clearly indicates battery and power status. 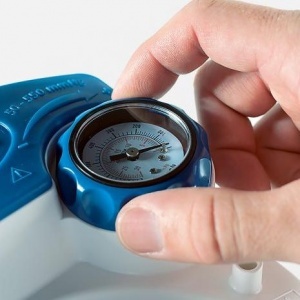 The required pressure can be adjusted with the pressure gauge. The large, easy grip adjustment gauge rotates making it easy to view and check that the pressure is set correctly. The new 800ml disposable canister has been designed primarily with hygiene and safety in mind. The anti-spill feature retains the contents in the bottle if it is tipped or tilted. There is also an integrated automatic float shut off system that prevents overflow of liquid and damage to the unit. The canister lid is made from a flexible material making it easier to remove when necessary. The new bacterial filter design is integrated into the canister lid making it extremely simple to exchange. 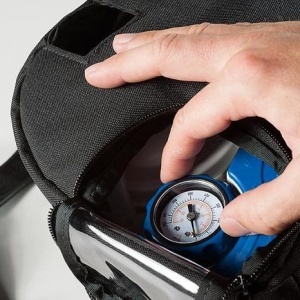 The Vacuaide 7314 QSU comes complete with a Personal Carry Bag. The unit and its accessories sit neatly in the bag and there are convenient pockets to store the power supply and accessories. The bag has been designed so that the unit does not have to be removed to be used. 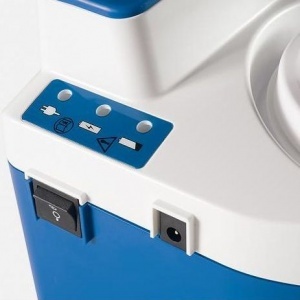 A pull-down flap allows the care-giver to to easily view the contents of the canister and there are also openings for attaching the power supply. There is a transparent window to allow the pressure set to be viewed. How long will the battery operate the unit? A fully charged battery will provide approximately 60 minutes of continuous operation at a zero vacuum level (free flow) Operation time will decrease with higher vacuum levels. What is recommended for the initial charge of the battery? A discharged battery will require 10-17 hours (depending on depth of discharge) of charging to reach a full capacity. If not in use for an extended period of time are there any recommendations for keeping the battery in good condition? Yes, it's our recommendation that the battery be recharged a minimum of every 3 months. If travelling internationally is there anything additional needed to use the unit? Yes, the correct power cord must be used, as the unit can operate on any AC voltage. What is the warranty of my unit? When should the filter of the disposable canister be replaced?